Cassidy designed this work and created the plaster model; the carving in granite of the final work was by local sculptor Arthur Taylor, using the first two mechanical pneumatic hammers which had been used in this way in the country. In 1900 Mr Taylor presented the hammers to the Aberdeen Mechanical Society. The site of the Duthie Park was originally a marshy piece of land covered in gorse (or whin, hence the nearby "Whinhill Road), it was known as Pulmoor, now "Polmuir". In 1850 Arthurseat (the villa on the site) and its surrounding land was intended to be developed as a Royal Garden to view the trains crossing the new viaduct to and from London via Ferryhill. However, in 1881 Lady Elizabeth Duthie of Ruthrieston purchased the site and gifted it to the City of Aberdeen for a public park. It was decided it should be "available for all classes of citizens, that it should have a broad expanse of grassy sward upon which the young might indulge in innocent frolic and play...". The park was designed by William R McKelvie of Dundee, and the first sod, of the 47 acres of land, was cut on the 27th of August 1881, the park being officially opened in 1883. 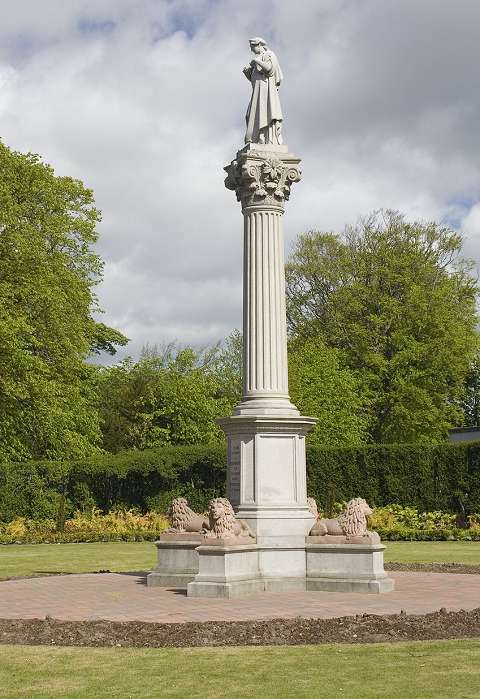 The Hygeia Statue, which was unveiled in 1897, commemorates the Miss Duthie's presentation of the Duthie Park to the City of Aberdeen, and its opening by Princess Beatrice. The four lions around the plinth of the statue are supposed to represent the strong citizens in the park. 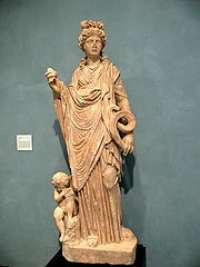 Hygeia is the Goddess of Health, she is shown as a virgin, holding a cup from which a snake (the symbol of health) drinks. Hygeia, known as Salus to the Romans, was said to have been the daughter of Æsculapius, and to have taken care of the sacred serpents. The picture above shows the 'Hope Hygieia', a seven-foot-tall, nearly one-ton marble statue of Hygieia, the goddess of health, on loan to the J. Paul Getty Museum from the Los Angeles County Museum of Art (LACMA). It was found in 1797 at Ostia, the ancient port of Rome. Duthie Park, Aberdeen: A standing figure of the greek goddess Hygeia in classical dress carved in pale granite. She represents a virgin holding a cup from which the symbol of health, a snake, drinks. She stands on a decorative corinthian column, the capital of which is decorated with large flowers seemingly made of acanthus leaves. Four recumbent lions in red granite lie at the base. 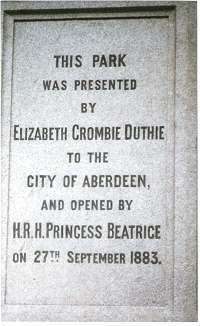 The park opened in 1883, the statue was conceived later as recognition of Miss Duthie's gift to Aberdeen. "Miss Elizabeth Crombie Duthie (a daughter of the merchant and ship owner Alexander Duthie) had been left substantial sums following the deaths of her uncle, Walter Duthie, a Writer to the Signet in Edinburgh, and her brother, Alexander Duthie, a well known advocate in Aberdeen. She wanted to create a permanent memorial to these two members of the legal profession and the suggestion of a park was accepted in style at a meeting of the Town Council on 5th July 1880." 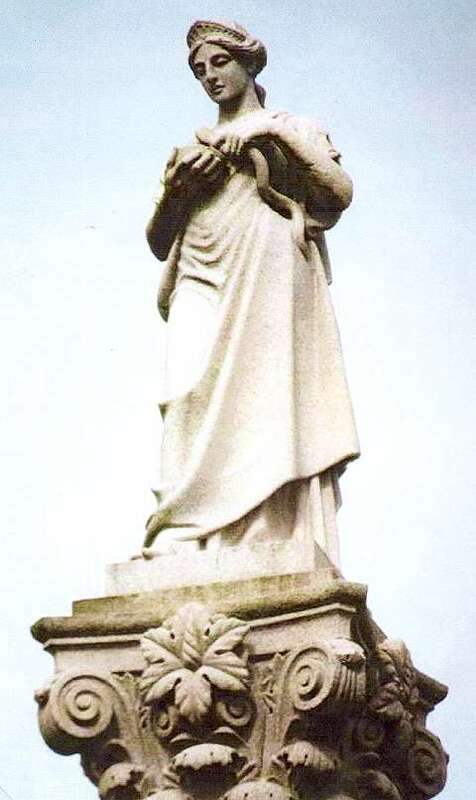 "Following the death of Miss Duthie in 1885, the Town Council agreed to erect a monument in her honour. The monument comprises a fluted Corinthian column supporting the Greek goddess of health, Hygeia. Four lions in red granite guard the base of the white granite monument. The contract for this monument had been awarded to Mr Arthur Taylor, monumental sculptor of Jute Street. He engaged a Mr John Cassidy, a sculptor with a studio in Manchester, to prepare the model in 1897. Mr Cassidy, native of County Meath in Ireland, assisted by Mr Schots, a Belgian artist, completed their work in December 1897. " Aberdeen City Archives, Scale Drawing of monument to be erected in the Duthie Park, (circa 1883); A I McConnochie, 50 views of the Granite City, (circa 1900), p46; Duthie Park 100 years of pleasure (1985); J S Reid, Mechanical Aberdeen, (1990), p8-9; W A Brogden, Aberdeen: an illustrated architectural guide (2nd Edition, 1998), p162; National Monuments Record of Scotland Photographs. Footnote: Lady Elizabeth Crombie Duthie lived at 34 Maberly Street, Aberdeen, and in 2005 a plaque was erected there in her memory. The building was demolished in 2008 and replaced by twelve luxury flats; the plaque is now carried by that building.